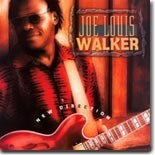 The wonderfully consistent Joe Louis Walker is back with still another great CD, New Direction. It's this issue's Pick Hit. Blues guitar legend Hubert Sumlin joins forces with some of blues and rocks biggest names on the excellent About Them Shoes, which is this month's Surprise pick. We re-visit one of the greatest blues albums of all time, Bobby "Blue" Bland's Two Steps From The Blues, in this month's Flashback. This month's What's New section features new releases from The Boogiemen, Carey & Lurrie Bell, Dr. John, David Jacobs-Strain, Jeremy Baum, Sean Costello, Richard Johnston, Luther Badman Keith, Bobby Wayne, Frank Ace, Lisa Phenix, Steve Arvey, and more.